So the first major championship of the year and the first major medal for TriPurbeck athletes. Racing in a super competitive field in the ETU European Sprint Duathlon Championships in Soria, Spain, Derek produced a stunning bike split performance which was the foundation of his success. A first run of 22min28sec for 5km followed by a blistering 42min bike meant that TriPurbeck’s number one silver fox (I’m sure I’ll be going grey soon as well) was off the bike in gold medal position. Unfortunately a combination of a Spanish dude in what can only be described as a transition hurry and Derek’s insistence on doing things quite properly and in the right order meant that by the time he left transition for the second 2.5km run he was in a battle for 2nd/3rd/4th place and in fairness to the aforementioned Spanish dude, he was pretty swift on his pegs and ran away from the rest of the field. Nip and tuck between Derek and a French chap ended in the French chap showing off his sprint finish to take silver but Derek nailed down the bronze finishing first Brit and ahead of the the chap who beat him recently at Clumber Park. An awesome performance and finally a medal for Derek who has performed so consistently but has really nailed his sessions this year. 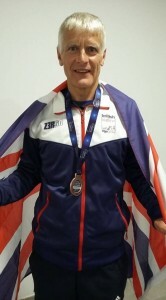 Great stuff and now he can hold his head high in the Bardsley household – the nice thing being that they didn’t have a bronze before what with all Sharon’s golds and silvers definitely more to come from derek we are sure……… especially if he can speed up a bit in transition! So on to the other racing news and despite it only requiring one sport, a fantastic result for Dave Brown in the Dorset Village marathon with a 3hr13min finish time in a hilly race. Neil McDermott was close behind in 3hr14min and once again Liz Goldsack produced the goods finishing in 3hr36min to win her age category. As I write, as far as I am aware none of them subsequently got on a bike or swam at all. Back to the multisporters and Nigel Cowler, Clodie and the head coach herself were in action in the Ashbridge Duathlon – an excellent race. The field wqas strong in all events and Clodie’s return to the fray in the sprint turned out to be an excellent performance finishing 4th in her age group just pipped for 3rd on the last few metres of the second run – but a great result nonetheless. Nige continues to go from strength to strength, pbing (yes that is a word) on the first 10km run and finishing in a shade over 3 hours. On to the undersized but not under powered head coach and a speculative first slightly long 10km left her 3min behind the lead. Fran didn’t close much on the first lap of the bike but it turns out that a mechanical issue on the bike had cost her time – who is her bike mechanic? Anyway, 2 blistering laps later she was in the lead and by the end of the bike the lead was 2mins. Not quite enough unfortunately as she was caught by a very fast running Rebecca Nkoane with seconds to spare. Great race from Rebeccca. Might have been different if Fran hadn’t had a mechanical…….. from my perspective – best nobody mentions it!